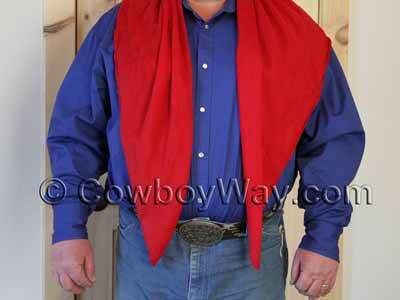 A wild rag is a cowboy or Western scarf. Note: Links with green underlines are shopping links and will open in a new window. 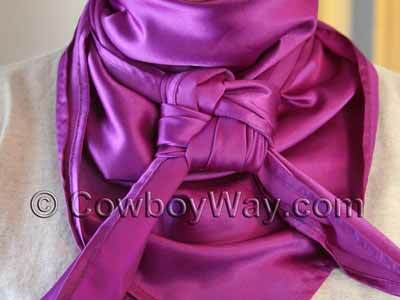 It's usually a point of cowboy or cowgirl pride to secure a wild rag around their neck by a scarf slide they're fond of, or some type of fashionable knot. 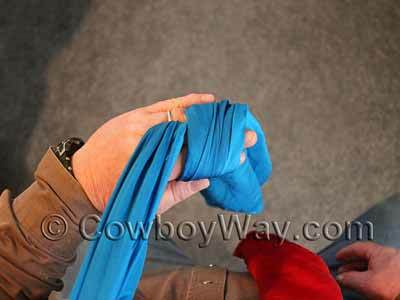 In the article and photos below we'll show you how to tie one kind of wild rag knot. Below: A wild rag knot. NOTE: Please keep in mind that a knot in a wild rag can hold tight when accidentally caught on something, making it potentially dangerous. 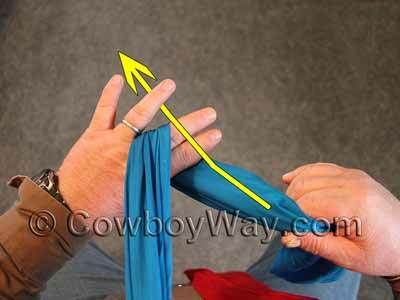 That's why some working cowboys and cowgirls only use a scarf slide when they're working, but when they go to town they might use a slide or a knot. We used two different wild rags, a blue one and a red one, to tie the knot in the photos. This made it easier to see how the knot was being tied. Instead of taking the photos head-on, we took them from the perspective of the person wearing the wild rag and tying the knot. To make capturing clear photos easier, we tied the knot pretty far down the wild rag. In reality, you'll probably want to tie your knot higher up, closer to the neck. Fold your wild rag into a triangular shape and put it around your neck. You can have the point of the triangle in the front or the back, it's your choice, but make sure the ends or tails of the wild rag wind up in front, one on each side of your neck. From this point forward we used two different wild rags, a blue one and a red one, to tie the knot in the photos. Tip: So that the ends of the tails are even when the knot is completed, begin with the right (red) side of the wild rag hanging down a little farther than the left (blue) side. To begin tying the knot, temporarily let go of the right (red) side. 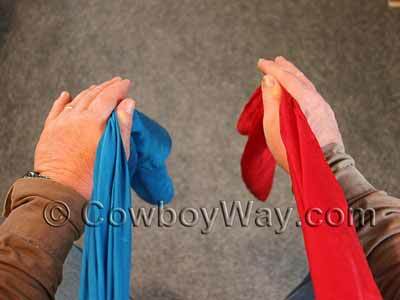 Pick up the tail on the left (blue) side of the wild rag with your right hand, and wrap it around the first two fingers of your left hand. Make one complete wrap. Close the fingers of your left hand around the tail of the wild rag tight enough to hold it in place, then let go of the tail with your right hand. Many wild rags are made of silk. Silk is a natural fiber that offers many benefits is a wild rag, but it can be somewhat temperamental to care for. For tips on how to care for a silk wild rag, please see our article How To Care For A Silk Wild Rag. Looking for a wild rag? You can shop for wild rags here.